Brad Ellis of Cask spoke at the ICEAA Central VA Chapter Meeting on February 20th. 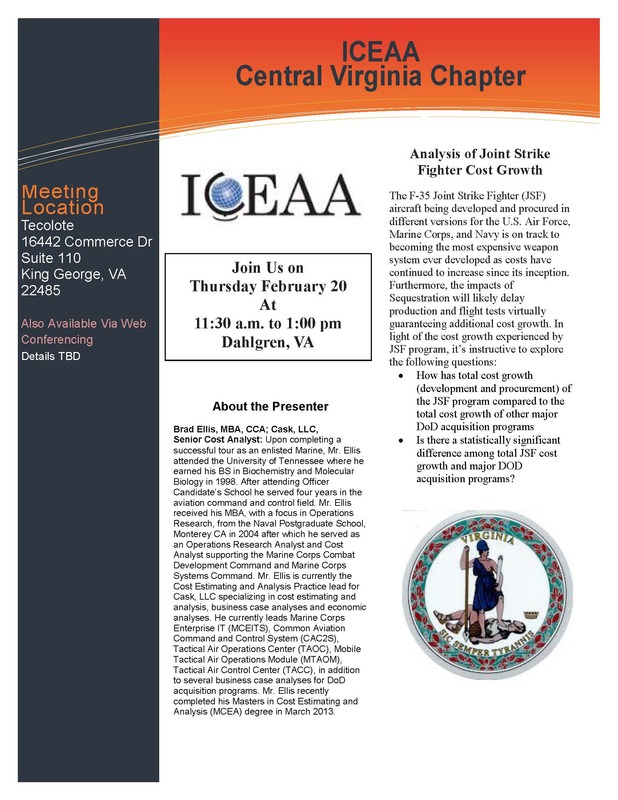 He discussed “Analysis of Joint Strike Fighter Cost Growth,” as featured in the Winter Edition of The Estimator. How has total cost growth (development and procurement) of the JSF program compared to the total cost growth of other major DoD acquisition programs? s there a statistically significant difference among total JSF cost growth and major DOD acquisition programs? Brad Ellis , Cask LLC-Upon completing a successful tour as an enlisted Marine, Mr. Ellis attended the University of Tennessee where he earned his BS in Biochemistry and Molecular Biology in 1998. After attending Officer Candidate’s School he served four years in the aviation command and control field. Mr. Ellis received his MBA, with a focus in Operations Research, from the Naval Postgraduate School, Monterey CA in 2004 after which he served as an Operations Research Analyst and Cost Analyst supporting the Marine Corps Combat Development Command and Marine Corps Systems Command. Mr. Ellis is currently the Cost Estimating and Analysis Practice lead for Cask, LLC specializing in cost estimating and analysis, business case analyses and economic analyses. He currently leads Marine Corps Enterprise IT (MCEITS), Common Aviation Command and Control System (CAC2S), Tactical Air Operations Center (TAOC), Mobile Tactical Air Operations Module (MTAOM), Tactical Air Control Center (TACC), in addition to several business case analyses for DoD acquisition programs. Mr. Ellis recently completed his Masters in Cost Estimating and Analysis (MCEA) degree in March 2013. To find out more about the presentation, please email brad.ellis@caskllc.com.